Some years back I was a regular visitor to Santa Fe, N.M. One of the things I saw there was the Bataan Memorial, commemorating the Bataan Death March of 1942. U.S. forces in the Philippines were besieged by the Japanese forces on the Bataan Peninsula until they were starved out. When they finally surrendered, they were marched 65 miles in scorching heat without food or water, and many died. About 1,800 members of the 12,000 U.S. troops were members of the New Mexico National Guard, who had been called up in 1941, prior to the outbreak of the war, to reinforce U.S. forces in the Philippines. Evidently the top brass thought that the predominantly Hispanic membership of the New Mexico guard could relate well to the Spanish-speaking population of the Philippines. On Memorial Day, we honor all Americans who sacrificed their lives while serving in the armed forces of our country. With all the recent controversy over Arizona and its immigration law, it is worth remembering that Mexican-Americans and others of Hispanic heritage are part of that heritage. They are not interlopers. The best book I’ve read on the current financial crisis was published right before the crisis occurred. 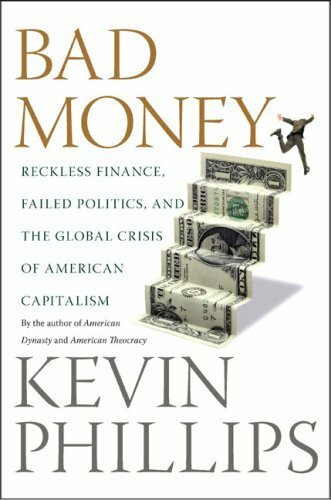 Bad Money: Reckless Finance, Failed Politics and the Global Crisis of American Capitalism, by Kevin P. Phillips, was written in 2007 and published in early 2008, and it all-but-predicted what was to happen next. Phillips asserted what I’ve been saying for 20 or so years, but with greater insight and better research – that the United States cannot go on forever consuming more than we produce, borrowing more than we save and importing more than we export, and that a day of reckoning will come. Simon Johnson and James Kwak in 13 Bankers proposed reforms to safeguard our financial system from recurrent crises. Phillips went further. He said we Americans will lose our material standard of living and our position in the world unless we find a way to recreate an economy based on production of goods and services rather than banking and finance. Phillips worked in the Nixon White House as a political strategist. His first book was The Emerging Republican Majority in 1969, and he has written extensively since then about history, politics and economic trends. The theme of his recent books is the shift from an economy based on production to one based on finance and debt, and why such an economy is not sustainable. During the first half of the 20th century, the United States had the most productive industrial economy in the world and, at the end of World War Two, the world’s only important industrial economy to emerge undamaged by the war. This enabled us Americans to enjoy the world’s highest material standard of living. We came to think of this as permanent and automatic, but it isn’t. Starting in the 1970s, the United States faced the challenge of other industrial nations – first Japan and Germany, then the east Asian “tigers” and now China and India – who were capable of matching us in productivity. The U.S. response was to hold down the wages of American workers, shift production overseas and facilitate the increase of borrowing and debt. Wages of American workers have been stagnant for the past 30 or so years. Average Americans have resisted the lowering of their material standard of living by working longer hours and more days of the year, by sending more family members into the work force (increasing labor force participation rates) and by taking on more debt. This process may have reached its limit. He was pleading with them as if they were a sovereign power in their own right. “This administration is the only thing standing between you and the pitchforks,” he reportedly said. The bank CEOs balked at Obama’s requests and since then have mobilized against even modest financial reforms. 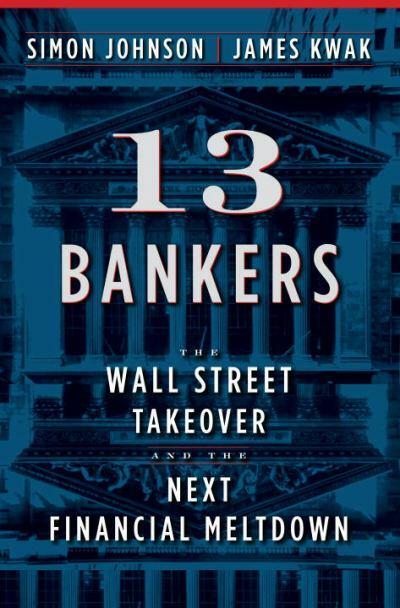 This story is told in 13 Bankers: The Wall Street Takeover and the Next Financial Meltdown, by Simon Johnson and James Kwak. Simon Johnson is a former chief economist for the International Monetary Fund. His brother-in-law, James Kwak, has had a successful career as a software entrepreneur and business consultant. In many ways, they argue, the United States fits the profile of faltering Third World oligarchies the IMF has had to bail out. And Obama, so far, has not challenged this. Their definition of an oligarchy is a nation in which economic power generates political power, and vice versa. They show how, for the past 30 years, a financial oligarchy has emerged and, under Democrats and Republicans alike, has steadily freed itself of governmental control while continuing to demand and get government bailouts. The recent bailout is only the latest and biggest of a long series, and is unlikely to be the last unless big changes are made. The savings of Americans, instead of being invested in American industry and contributing to the nation’s economic growth, have been diverted to a kind of high-stakes poker game that benefits nobody but the winners, and in which the big losers are bailed out. This will not end, they say, until the big banks are broken up, as President Theodore Roosevelt broke up the Standard Oil trust. Residential segregation by race is such a key fact of American life that it seems as if it has existed from time immemorial. And it also seems like the result of a natural process – if not members of different races voluntarily sorting themselves out, then as a result of impersonal economic factors that have to do with race only by coincidence. Two books I read a couple of years ago show this isn’t so. The recent discussion of the 1964 Civil Rights Act reminded me of them. 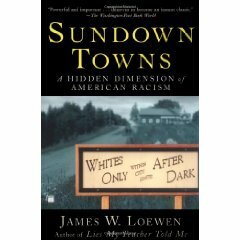 One is Sundown Towns: a Hidden Dimension in American Racism by James Loewen. He describes how American small towns between 1890 and 1940 used violence and governmental authority to drive out their black residents, a historical event which has been forgotten and covered up in the years after. The other is White Flight: Atlanta and the Making of Modern Conservatism by Kevin M. Kruse. It gives a blow-by-blow account of the civil rights struggle in Atlanta in the 1960s, and tells each victory for racial integration led to white people withdrawing to the suburbs and allowing the city to become a black ghetto. No foolproof system is proof against a sufficiently talented fool. Click on this for another amazing photographic report from the Boston Globe. Barry Goldwater was a fine human being. I would have been proud to know him. He was not a racist. He was a founding member of the Arizona NAACP and helped bring about the desegregation of the Arizona National Guard. His position was that governmental authority should never be used to uphold racial discrimination or segregation. At one time that was the progressive position. Goldwater was a friend of the native American tribes of Arizona, and more open-minded than most straight people of his era about gays and lesbians. His opposition to the 1964 Civil Rights Act was on a matter of constitutional principle, that the government had no right to tell owners of private businesses who they should serve or who they should hire. It was in the same spirit as the American Civil Liberties Union, which defends the right of free speech even for racists and radicals. But whatever Goldwater’s intent, his position was the beginning of the process which transformed the Republican Party from the party of Lincoln to the part of the white South. He had no sympathy for cross burners and church bombers, but they found aid and comfort in Goldwater’s position. That is why the only states that Goldwater carried were his home state of Arizona plus South Carolina, Georgia, Alabama, Mississippi and Louisiana. When the 1964 Civil Rights law was passed, President Lyndon Johnson said the Democratic Party had lost the South for a generation. George Wallace carried the Deep South in 1968 and the Republicans in every election since then. The Solid South is as solid for Republicans as it once was for Democrats. While Democrats were credited and blamed for the 1964 law, it got stronger support in both the Senate and House of Representatives from Republicans than from Democrats. But, except for Richard Nixon, the individuals who represented the future and energy of the Republican Party were against it. Ronald Reagan was against it. George H.W. Bush was against it. Future Chief Justice William Rehnquist was against it. William F. Buckley Jr. and Milton Friedman were against it. I don’t have any reason to accuse any of these individuals of racism. I knew a white Republican physician in Hagerstown, Md., who had many black patients in 1964, in a time and place when that was not taken for granted, and was a strong Goldwater supporter. But it is because of the Goldwater movement that Strom Thurmond, Jesse Helms and David Duke found their home in the Republican Party. The libertarian philosophy has a strong appeal, especially to intelligent young people, and has had a powerful impact on American life through such public figures as Barry Goldwater, Ronald Reagan and Alan Greenspan. There is a lot to be said in favor of philosophy whose supreme value is the right of individual human beings to make choices and live as they wish, provided they do not infringe on the freedom of others. If you have to have one supreme principle that outweighs all the others, that is not a bad one. I was much interested in libertarian philosophy during the Reagan era, and I still think that deregulation and cuts in marginal tax rates were a good idea up to a point. I don’t agree with Libertarians that governmental activity is by definition an infringement on freedom, and private business activity never is. And I don’t agree that governmental activity is by definition unproductive, and that private business activity never is. These things are sometimes true, but not always true. Why is BP still in charge? The first thing BP did after the oil spill was to have its lawyers fan out along the Gulf Coast and try to get people to accept $5,000 payments for signing away their right to sue for damages. At the same time survivors of the Deepwater Horizon oil rig explosion say they were held incommunicado until they signed away their right to sue for damages. BP is using toxic industrial chemicals to try to disperse the oil. It refused to comply with an Environmental Protection Agency order to use a less-toxic chemical because it said the alternative wasn’t available. When BP filed for its permit for the Deepwater Horizon well, it said it could easily handle an oil spill 60 times larger than Deepwater Horizon. This was a falsehood, just like BP’s initial estimate of the amount of the spill. BP executives meanwhile are acting like little tin dictators, barring the press from lands it doesn’t actually own. With all this, why is BP still in charge of the cleanup? Maybe it is because the Obama administration doesn’t have any better idea of how to deal with the situation than BP officials do. This may be partly because the responsible government agencies were pretty much ruined under the Bush administration, and there hasn’t been time to rebuild. Or maybe President Obama is, as usual, giving the benefit of the doubt to people and institutions who don’t deserve it. A “death panel” for Social Security? President Obama has appointed an 18-member National Commission on Fiscal Responsibility and Reform which is stacked with opponents of Social Security. It is scheduled to issue a report after this year’s fall elections to be voted on by the lame-duck Congress. Based on the makeup of the commission, it is likely that it will recommend cuts in Social Security benefits and increases in taxes. The rationale for cutting Social Security is that it is supposedly in deficit. More will be paid out this year in Social Security benefits than will be collected in taxes. But this is a phony issue. For decades, American workers have been paying extra Social Security taxes to build up a surplus which now will be drawn upon. When I worked, I paid into an Individual Retirement Account. Now that I am retired, I draw money from my IRA. When I worked, I paid Social Security taxes over and above what was necessary to support current retirees, and these taxes were invested in U.S. Treasury bonds. Now that I am retired, the government will cash in some of these bonds to support my Social Security pension. 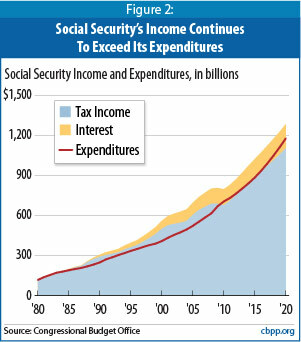 After Social Security taxes were increased during the Reagan administration, the surplus in the Social Security trust fund was subtracted from the government’s overall deficit to make it appear the government was more solvent than it was. This was used to justify upper-bracket tax reductions. Now that the government is in deficit, partly due to these upper-bracket tax cuts, the so-called deficit hawks want to cut Social Security. A cynical person might call this a bait-and-switch scheme. Raising the retirement age is an especially bad idea. It is proposed mainly by college professors, business executives and foundation staff members who don’t have to do heavy lifting or stand on their feet all day. One argument is that the retirement age of 65 was set by Bismarck when he set up the German Social Security system in the late 19th century because that was the average life expectancy during that era. The assumption is that people like me who are able to spend retirement years in good health are getting away with something. My answer is that there should be such a thing as progress. It is a good thing, not a bad thing, that I don’t have to endure some of the things my ancestors did. The ironic thing about this issue is that the defense of Social Security will come mainly from people my age, who probably will be held harmless in any change in the system. The people who will be hurt are people of the age of my niece and nephew, many of whom have been convinced by decades of propaganda that Social Security will not be there for them when they retire. This could become a self-fulfilling prophecy. President Obama’s response to the BP oil spill in the Gulf of Mexico is the least you could expect under the circumstances. And he is under attack from the right wing even for that. When the seriousness of the disaster became apparent, President Obama formed a task force of top administration officials, while the Secretaries of the Interior and of Homeland Security and then Obama himself flew to the scene. But they left the actual work of trying to cap the spill was left to BP. President Obama scolded BP, the oil rig owner Transocean and the oil services company Halliburton, but he reaffirmed his policy of continuing offshore oil drilling. He announced a temporary moratorium on new oil drilling, and since then there have been seven new drilling permits and five environmental waivers (no permits for new wells, however). He announced he will appoint a special commission to investigate the causes of the disaster and make recommendations, and one of the first two appointees to the commission is the head of the Bush administration’s Environmental Protection Agency. From the standpoint of the shrimp fishermen and property-owners along the Gulf Coast, this must seem like thin soup. But it is too strong for Rand Paul, the Kentucky Republican Senatorial candidate. He said it is “un-American” for Obama administration officials to speak so harshly of BP, a foreign-owned company formerly known as British Petroleum. Senator James Inhofe, an Oklahoma Republican objected to a proposal to increase the cap on oil company liability for such disasters from $75 million to $10 billion (that’s million and billion) because it would be too burdensome. BP’s profit was $26.5 billion in 2008 and $14 billion last year, so such liability would not put it out of business. But all these folks seem positively reasonable compared to Rush Limbaugh, who speculated, on the basis of nothing at all, that supporters of President Obama may have sabotaged the oil well in order to advance some kind of environmentalist agenda. We don’t yet know how bad the Gulf disaster will be. Some scientists expect a long-term degradation of the Gulf fishery and environment, rather than spectacular pollution as in the Exxon Valdez tanker disaster. And we don’t whether better regulation could have averted the disaster. Maybe if we follow the best practices of the oil industry elsewhere, such as in the North Sea, we can guarantee it won’t happen again. Maybe it is inherently impossible to drill for oil 5,000 feet beneath the ocean floor and do it safely. When you stop and think about it, it is amazing that it is possible at all. The country wouldn’t suffer if we suspend drilling for now. The Gulf provides a tiny fraction of our oil supply and provides a tiny fraction of our reserves. If we ever really need it, it will be there. It won’t go away – except of the millions of gallons each day gushing out into the ocean from the failed Deepwater Horizon well. 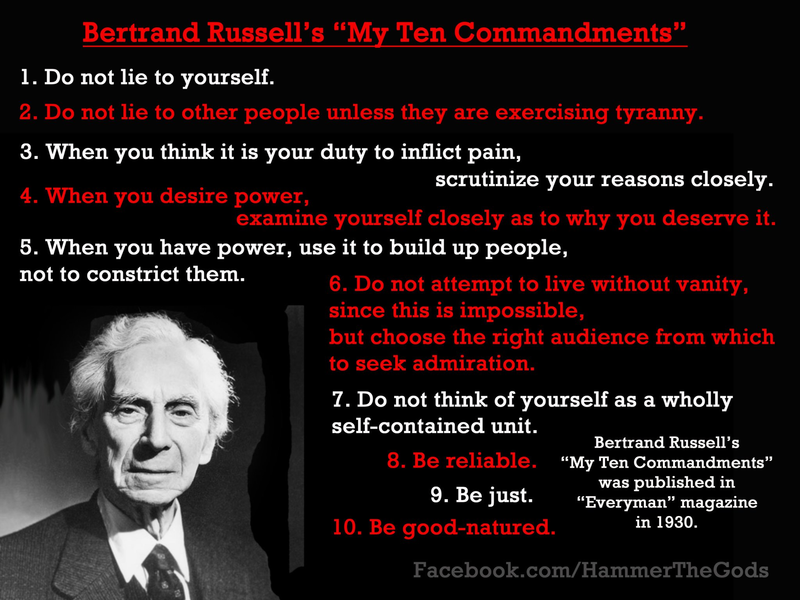 The philosopher Bertrand Russell wrote his own personal set of ten commandments. They were published under the title “My Ten Commandments” in Everyman magazine in 1930. 1. Do not lie to yourself. 2. Do not lie to other people unless they are exercising tyranny. 3. When you think it is your duty to inflict pain, scrutinize your reasons closely. 4. When you desire power, examine yourself closely as to why you deserve it. 5. When you have power, use it to build up people, not to constrict them. 6. Do not attempt to live without vanity, since this is impossible, but choose the right audience from which to seek admiration. 7. Do not think of yourself as a wholly self-contained unit. Years later he wrote another set of ten commandments, this one just for teachers. It was published in an article entitled “The Best Answer to Fanaticism – Liberalism” in the New York Times Magazine in 1951. Click on this and then click on “watch” to see something a bit weird. At first I thought it was a trailer for a science-fiction movie, but it isn’t. I can stop any time I want. I have been a voracious reader of books since I was a young boy. I still am, but for many years now, I’ve spent increasing amounts of time each day reading articles on Internet web sites and web logs. I notice that my ability to concentrate is much less when I am sitting in front of a screen than when I am sitting with a book on my lap. I’ve wondered whether this is something inherent in the technology or whether this is because my habits were formed well before the computer age. Or whether this is just part of growing older. Nicolas Carr published an article in The Atlantic magazine two years ago arguing that it is the technology. He has developed his argument in a new book, The Shallows. 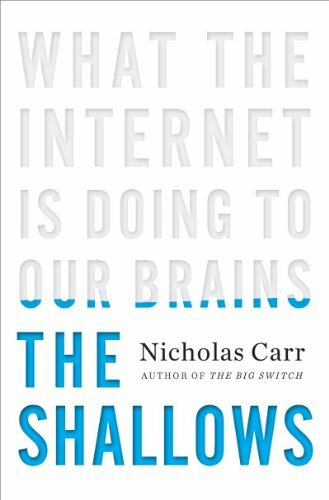 He argues that the limited human brain cannot at the same time keep up with all the multitasking, multimedia, advertising popups and other distractions on a typical Internet site, and at the same time devote full attention to the text. Even the micro-decisions involved in passing over hyper-links use up cognitive capability, he said. Accordingly, I have put the links for this post below the fold. I suppose the same would hold true of the distractions of Fox News, CNN and other cable news channels. If you are following the news ribbon at the bottom of the screen, and all the other graphics, it is hard to concentrate, let alone think critically, about what the newscaster is saying. Years ago, when I would get home from work, I would flop myself down on my sofa, turn on the TV set and start cycling through the channels. Even when I couldn’t find anything I wanted to watch, I would keep on channel-surfing. After I retired, I broke the TV habit. I have Basic cable service and seldom watch TV, but I spend almost as much time Internet-surfing now as I did channel-surfing then. By starting this web log, I have put my Internet habit to what I hope is a socially productive use. In moderation, it should not interfere with my ability to enjoy the pleasures of reading and conversation. If this proves to be untrue, I can stop any time I want. The Second Amendment to the U.S. Constitution says that U.S. citizens have an individual right to own firearms, just as they have an individual right to freedom of speech and due process of law. Throughout history and in many different cultures, denial of the right to own weapons and denial of access to the courts have been ways in which disenfranchised groups have been held down. Ownership of firearms by responsible law-abiding citizens is not a social problem. That said, even fundamental rights, such as the right to vote, are subject to reasonable regulation consistent with their purpose. That said, taking firearms to Tea Party political rallies is an extremely bad idea. I am old enough to recall the exercise of Second Amendment rights by the Black Panther Party of Self-Defense. That didn’t work out well. During the 2004 election, Senator John Kerry, the Democratic nominee, told an unemployed worker that he had no real answer to the outsourcing of U.S. jobs overseas, but that he unlike President George W. Bush would not make things worse. This was an honest statement, and a true statement, but it also was an inadequate statement. Does President Barack Obama have any better answer than Senator Kerry did? If not, what good are the Democrats? Joe Bageant, in Deer Hunting With Jesus, and Thomas Frank, in What’s the Matter With Kansas? wrote about the disconnect between college-educated white liberals and the struggles of working people. They pointed out that it is not so much that so many working people vote on the so-called cultural issues – abortion, gay rights, school prayer – rather than economic interests, as that there is not a dime’s worth of difference between the two parties on economic issues. I have to admit that I don’t have a complete answer to these problems myself, but then I’m an old retired guy in Rochester, N.Y., not someone who claims to be qualified for the highest office in the land. I think that a good start for a Democratic administration would be to (1) take advice from labor and consumer organizations more than investment bankers, (2) put people to work repairing our deteriorating bridges, levees, water and sewer systems and other infrastructure, (3) regulate and break up predatory financial institutions that divert savings and wealth away from the real economy, (4) use the power of government contracting to foster “green” and high-tech industry, as was done in an earlier era with semiconductors, the airlines and other industries and (5) yes, as Kerry said, stop making things worse, such as with tax breaks for industries that close U.S. plants and relocate overseas. When Michael Harrington wrote The Other America, the classic 1962 book about poverty in the United States, he defined the problem as the inability of certain groups – inner-city black people, migrant farm workers, Appalachian mountaineers, elderly people on fixed incomes and so on – to share in the expanding prosperity of the nation as a whole. His book inspired Lyndon Johnson’s Great Society programs, which sought to bring members of poor and disadvantaged groups into the mainstream of the U.S. economy. Those goals have been the goals of most self-identified liberals ever since. After Rima Fakih, an Arab-American college student, won the Miss USA beauty pageant, the conservative commentator Daniel Pipes wrote that it is highly suspicious that so many young women of Muslim heritage have been winning beauty contests lately. Maybe so. Maybe Western secularists want to tempt young Muslim women into entering swimsuit competitions, and violate their religion’s teaching about modesty in dress. That is more plausible than thinking there is widespread prejudice and discrimination against white Protestants. A friend of mine who teaches in college says that students nowadays take memory-enhancing drugs so they’ll do better on exams. They don’t admit it themselves, but they all say they know others who do. And what, those students may ask, is wrong with that? How is it different from drinking coffee to stay alert? If people can make themselves smarter, stronger, less depressed or more focused by taking a drug, isn’t this a good thing? Well, it depends. If everybody used these drugs, would it be of benefit to all? Would everybody be able to function on a higher level? Or are these drugs part of a zero-sum game, whose only purpose is to gain an advantage over those who don’t use drugs? No chemical substances that has any biological effect at all is entirely without risk. What do we know about the side effects? It is like plastic surgery. No reasonable person would object to plastic surgery for someone who was disfigured. But what about a reasonably attractive person who wants to become even more attractive? Suppose everybody did this. Would the percentage of people regarded as attractive increase? Or would there merely be a raising of the bar for the standard of beauty? Competition is a means to an end, not a good in itself. Competition is good when it encourages people to strive for excellence. It is not good when it encourages people to do things that are harmful to themselves or others just to win. Whatever you or I answer, one segment of society will have no qualms about performance-enhancing drugs. That is the military. If you think it is all right to order people to do things that put them at high risk of being killed, you can’t reasonably object to giving them drugs to reduce that risk. And where the military goes today, the rest of society goes tomorrow. Unless Congress passes legislation to re-regulate financial predators and break up the “too big to fail” financial institutions, we as a nation are in for repeats of what we’ve experienced in the past 10 or 20 years – long stretches of economic stagnation interrupted by economic crises. Our future prosperity depends upon restoring the banking and financial system to its historic role of turning savings into investment in the real economy. We know Wall Street financiers make big campaign contributions, and we know Wall Street executives have held and still hold high executive positions under Republican and Democratic administrations alike. But the source of the banking and finance industry’s greatest power is more than that. It is its power to drive up interest rates and crash stock and bond prices if the government’s actions displease it. When President Andrew Jackson refused to renew the charter of the Bank of the United States, a privately-owned bank with roughly the same power as the Federal Reserve System today, the president of the bank, Nicholas Biddle, deliberately brought on a recession by restricting loans. Jackson thought this was not too high a price to pay to destroy the bank’s financial and political power. I don’t think today’s financiers and bankers would do anything that blatant, but they wouldn’t have to. The “automatic” working of the market would do the job. This is a great danger when the federal government is running huge deficits, and needs low interest rates to keep them under control, and when the new economic recovery could be aborted by a fall in stock prices. When Bill Clinton was President, he accepted as a fact that he could not do anything that would disrupt financial markets. One of Clinton’s advisers, James Carville, famously remarked that if he died and was reincarnated, he wanted to come back as the bond market, because everybody would fear and obey him. But the financial markets are not a proxy for democracy. As long as we Americans are governed by the financial markets, we are not a self-governing people. The Democrats are no longer the party of wage-earners, and the Republicans are no longer the party of the property-owning middle class. The two parties divide over cultural issues such as abortion rights, gay rights and so on, but both defer to Wall Street and entrenched wealth. If I am wrong about this, one party or the other or both will get behind legislation to bring the banking system back under reasonable regulation and break up the Too Big to Fail institutions. After the 9/11 attacks, George W. Bush said the jihadist terrorists hate us Americans because of our freedoms. Ever since, we Americans have responded to each attempted terrorist attack – the most recent by a guy too incompetent to set gasoline on fire – by surrendering one more freedom to Big Brother. If the purpose of terrorism is to terrorize, the terrorists are succeeding. They have turned the land of the free and the home of the brave into a nation of ‘scaredy cats. I was sickened by the USA Patriot Act and the George W. Bush administration’s embrace of torture. We Americans in our history have been guilty of lynch law and mob violence, but the cold cruelty practiced by the KGB and the Gestapo historically has been alien to us. I voted for Barack Obama with great enthusiasm because I thought he would restore constitutional government. But President Obama has been worse – much worse – that President Bush. He has not ended torture, merely relocated it. He has asserted the right to order the killing of anyone, including American citizens, that the U.S. government in someone’s subjective judgment deems a terrorist. He has asserted the right to strip Americans of their citizenship based on the same subjective judgment. He wants deny basic constitutional rights to due process to anyone accused – not judged by any process – to be a terrorist. People in villages in Afghanistan – people with the same inherent dignity as human beings that you and I have, people with no more personal guilt than the office workers in the World Trade Center – are routinely killed by predator missiles because somebody has made a determination that an insurgent is operating in their vicinity. The crimes for which Richard M. Nixon was impeached are the equivalent of illegal parking compared to what is going on today. But the responsibility is not Barack Obama’s. It is mine. My government every day commits crimes against humanity, as defined by international law, while I live my quiet, pleasant life and not only fail to do anything about it, but go whole days without thinking about it. I don’t think the United States is the equivalent of Nazi Germany or any other dictatorship, but the administrative machinery and legal basis for a dictatorship are in place for anyone who cares to use them, while we Americans – myself included – come to accept things as normal that we once would have considered unspeakably evil. Clarke’s First Law. When a distinguished but elderly scientist states that something is possible, he is almost certainly right. When he states that something is impossible, he is very probably wrong. Asimov’s Corollary. If a scientific heresy is ignored or denounced by the general public, there is a chance it may be right. If a scientific heresy is supported by the general public, it is almost certainly wrong. Clarke’s Second Law. The only way of discovering the limits of the possible is to venture a little way into the impossible. Clarke’s Third Law. A sufficiently advanced technology is indistinguishable from magic. Arthur C. Clarke was a British science fiction writer whose works include Childhood’s End and the script for Stanley Kubrick’s “2001: a Space Odyssey.” Isaac Asimov was an American science fiction writer best-known for the I, Robot and Foundation stories. You must finish what you have written. You must put what you have written on the market. You must keep it on the market until sold. Robert A. Heinlein was possibly the leading American science fiction writer of the 1940s and 1950s and a popular writer until his death in 1988. He graduated from the U.S. Naval Academy in 1929 and served as a radio communications officer on the USS Lexington, the U.S. Navy’s first modern aircraft carrier. He was discharged from the Navy in 1934 with pulmonary tuberculosis, and tried different ways of earning a living until he submitted a story to Astounding Science Fiction magazine in 1939. He wrote a series of young adult novels which I read as a teenage boy, and I read most of his novels and stories during his lifetime. His rules for success in writing is that most people who think about writing never actually start, those who start never finish, and those who finish either never submit their work for publication or become discouraged at the first rejection. He had a fifth rule, Do not rewrite except to editorial order, which I have omitted. His idea was that any writing is marketable at some level of publication, and that if you think of a better way to write something, you should write a new and better story or article. I think everything Heinlein wrote was marketable at some level, but this is not necessarily true of less talented writers. The other night I had the following dream. On my street there was a family who was really troublesome. The father couldn’t hold down a job. The mother did a bad job of raising the children. The children misbehaved. They couldn’t budget. They couldn’t maintain their property. They couldn’t get along with each other or with neighbors. In short, the family was completely dysfunctional. I decided it was my duty to help them get on the right path. I knocked on the door, they wouldn’t answer, so I broke into the house at gunpoint. The family resisted, and unfortunately a lot of furniture got broken in the process. I regret this, but obviously it wasn’t my fault. I kicked the family out of the main bedroom, and moved all my stuff in. The next day I started telling them how to live, but for some reason they wouldn’t listen. Instead they acted as if I was the problem. I told them they couldn’t have access to the refrigerator or the pantry without my permission, and that got their attention. Unfortunately by this time the refrigerator was broken. I tried to fix it, but, perversely, they kept interfering with me. Finally I had no choice but to shoot the oldest son.